Kinka: Traditional Songs from Avenorpedo is an audio recording produced in Ghana in 2007, initially released as a cassette tape for the Ghanaian market (2007), and now available as a richly annotated CD for the North American market (2010). 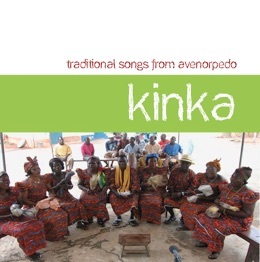 Both feature the same recordings of traditional Ewe music from Ghana's Volta Region, especially Kinka songs of the celebrated Ewe composer Kwasi Norvor Afornorfe. The first cassette printing (1000 copies) sold out and a new one is in progress. The CD version also includes a 40 page ethnographic booklet, containing ethnographic background, a map, interviews, photographs, song lyrics and translations. This recording is part of a Canadian Centre for Ethnomusicology music/development initiative called Music for Global Human Development, and in particular its subproject Music for Cultural Continuity and Civil Society. By supporting traditional, participatory Ewe music in mediated form, we hope to help ensure its continuing relevance in Ghanaian society, whose airwaves presently fill with hiphop and hiplife, consumer musics exhibiting a strongly western character. Recording Kinka and making it available to Ghanaian radio stations helps inject traditional music into the local media space, thereby displacing more commercial, westernized, passivating pop, and helping to ensure musical continuity across generations. Regular broadcasts on Ghanaian stations such as Jubilee Radio have developed a broad audience, and helped draw the youth back to traditional performance contexts in large numbers. In this way, music helps foster cultural continuity and civil society, maintaining a strong social fabric and cultural identity during a period of rapid economic-technological change. CDs are $15 each plus postage. All income goes to benefit local Ghanaian music and musicians. Discounts are available for ordering more than one. If you’re interested in using this CD for teaching, please write me at the address below for bulk rates. Florian Carl. (2015). Yearbook for Traditional Music, 47, 209–210. This project was completed under the auspices of the Canadian Centre for Ethnomusicology, thanks to generous grants from the Presidents Fund (Department of Music) and the SAS Fund in the Faculty of Arts, University of Alberta.